major influence on the activities of organisations. standard of this sector have not produced intended results. initiatives, knowledge an d capabilities of others . sociated with occupational health and safety . costs rather than as investments. led to the poor level of HSM evident in the sector . than in large enterprises [39,40]. location was defined in line with the sugg estion by M. J.
mingham Health, Safety and Environment Association. lines on this subject . ships and collaborations within supply chain networks. the welfare (including health and safety) of its employees. as well as operations of a business exists. Figure 1. Distribution of image protection as a motivator. less than 5. The minimum expected cell frequency is 56.0. Table 4. Source of health and safety information. the peculiar nature of SMEs discourages trade unionism. better media for information dissemination. from professional representatives or trade bodies . they need ed more training on the use of the intern et . ganizations was preferred by SM Es [2 2 ] . also shown as a major constraint in Figure 2.
on specific improvement activities implemented. are determinants to successful business strategies . Figure 2. Health and safety management constraints. Table 5. 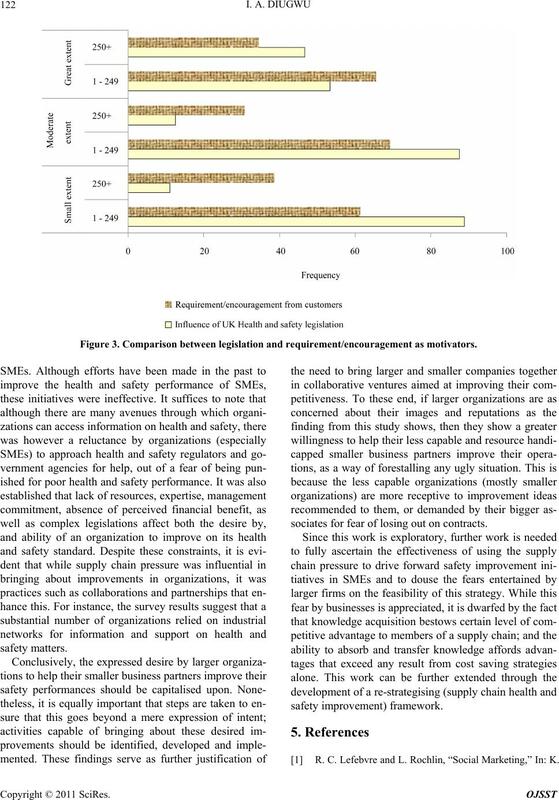 Strategies for supply chain he alth and safe ty management. Table 6. Specific partnership improvement activities. petitive advantage by orga nizations [70-74]. of legislation (Figure 3 below). who had achieved BS 5750 standard . maining on the list of preferred suppliers/contractors . competitions are now between entire value chains . Figure 3. Comparison between legislation and requirement/encouragement as motivators. sociates for fear of losing out on contracts. R. C. Lefebvre and L. Rochlin, “Social Marketing,” In: K.
Practice, 2 Edition, Jossey-Bass, San Francisco, 1997.
and Safety Legislation,” Journal of Safety Research, Vol. 32, No. 4, 2001, pp. 441-463. Vol. 117, No. 4, 1997, pp. 211-215. Publishing Ltd., Sheffield, 2001, pp. 71-82. BKK Federal Association, Essen, 2001. 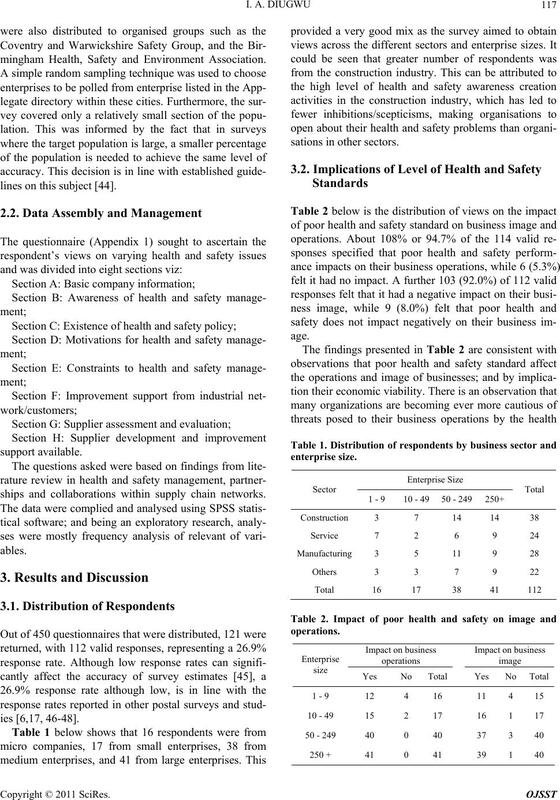 Safety Science, Vol. 42, No. 1, 2004, pp. 69-83. 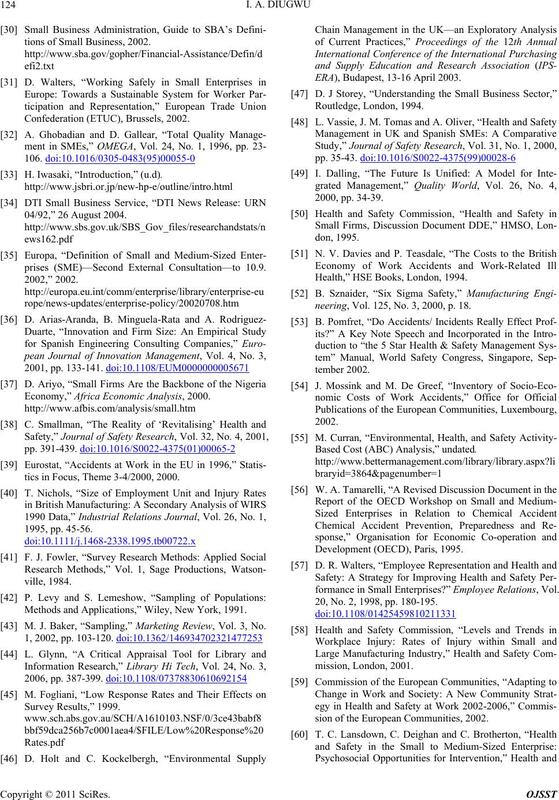 Journal of Workplace Learning, Vol. 15, No. 6, 2003, pp. Science Monitor, Vol. 7, No. 1, 2003, pp. 1-13.
on Industrial Relations, Sacramento, 1992. 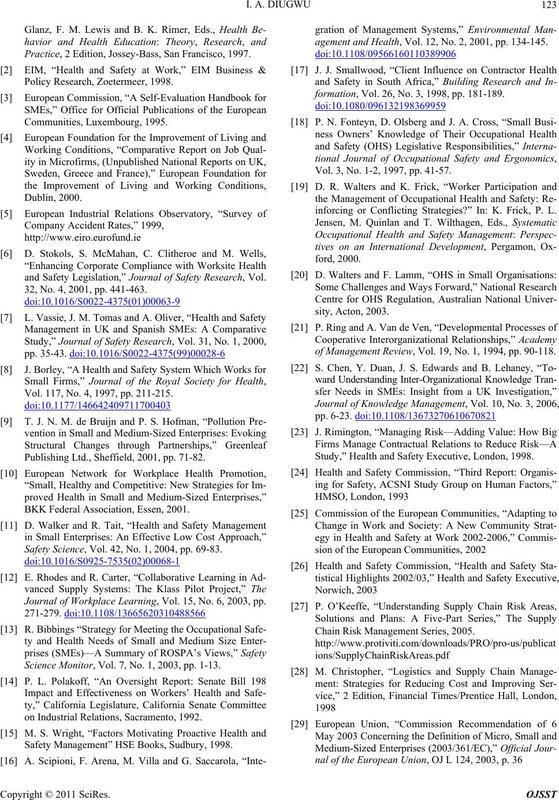 Safety Management” HSE Books, Sudbury, 1998.
agement and Health, Vol. 12, No. 2, 2001, pp. 134-145.
formation, Vol. 26, No. 3, 1998, pp. 181-189. Vol. 3, No. 1-2, 1997, pp. 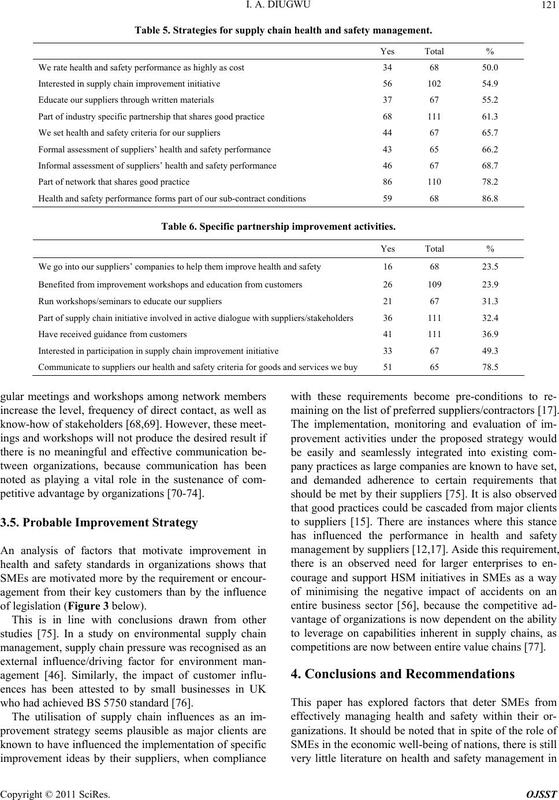 41-57.
inforcing or Conflicting Strategies?” In: K. Frick, P. L.
of Management Review, Vol. 19, No. 1, 1994, pp. 90-118. 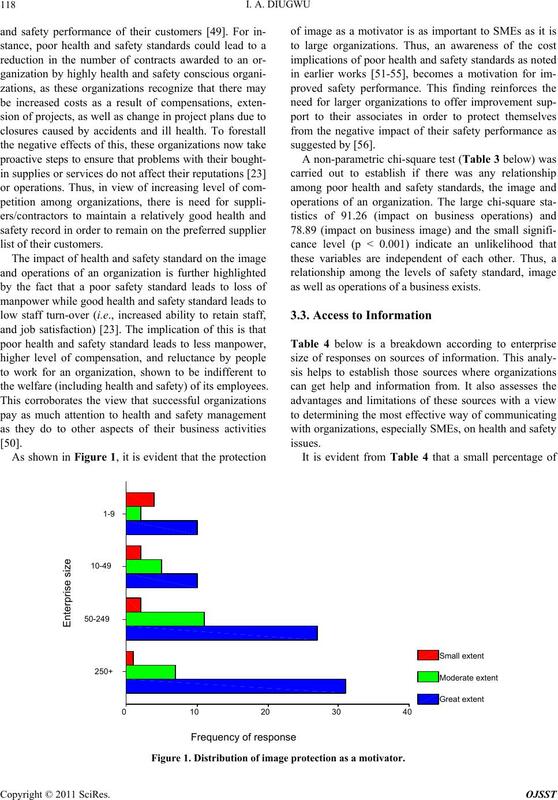 Study,” Health and Safety Executive, London, 1998. 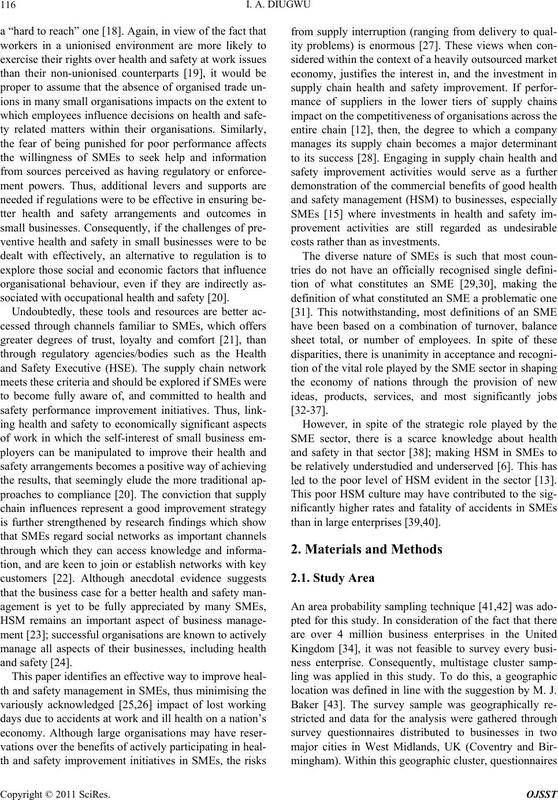 Chain Risk Management Series, 2005.
tions of Small Business, 2002.
prises (SME)—Second External Consultation—to 10.9. Economy,” Africa Economic Analysis, 2000.
tics in Focus, Theme 3-4/2000, 2000. Methods and Applications,” Wiley, New York, 1991. M. J. Baker, “Sampling,” Marketing Review, Vol. 3, No. ERA), Budapest, 13-16 April 2003. Health,” HSE Books, London, 1994.
neering, Vol. 125, No. 3, 2000, p. 18. Based Cost (ABC) Analysis,” undated. 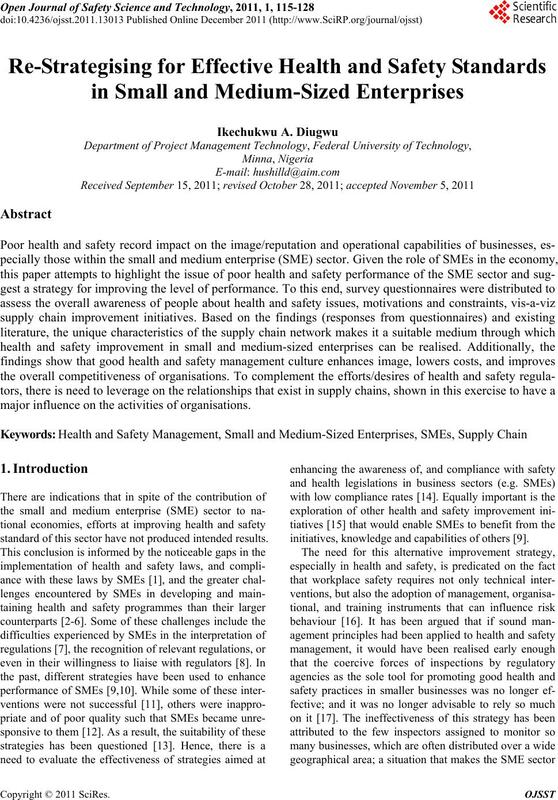 formance in Small Enterprises?” Employee Relations, Vol. 20, No. 2, 1998, pp. 180-195.
sion of the European Communities, 2002. Greenleaf Publishing Ltd., Sheffield, 1996, pp. 30-49. Y. Duan, R. Mullins, D. Hamblin, S. Stanek, H. Sroka, V.
No. 9, 2002, pp. 430-441. Strategic Management Journal, Vol. 17, 1996, pp. 55-83.
ment, Vol. 28, No. 7, 1998, pp. 524-546. 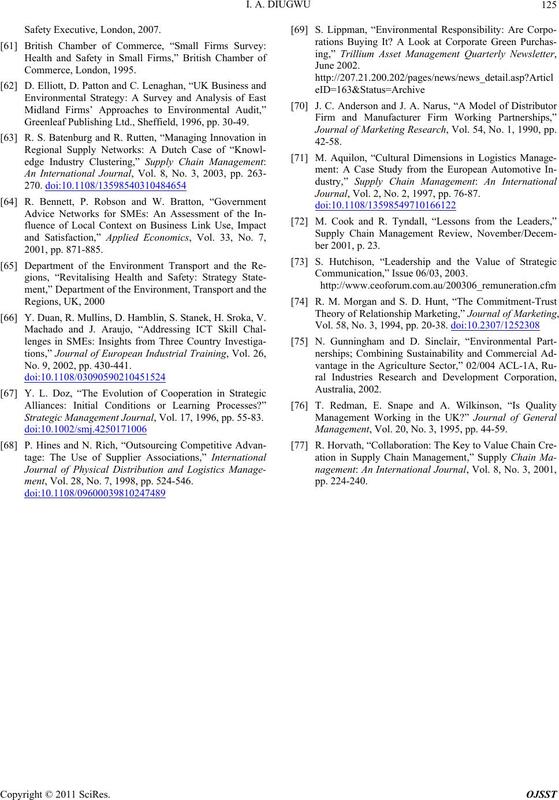 Journal of Marketing Research, Vol. 54, No. 1, 1990, pp. Journal, Vol. 2, No. 2, 1997, pp. 76-87. Management, Vol. 20, No. 3, 1995, pp. 44-59. A.3. To which of these industries does your business belong? B.3. What percentage of the total working week of the person in (B.2.) above is spent on Health & Safety management duties? B.4. Who else is involved in your company’s health and safety management? B.6. 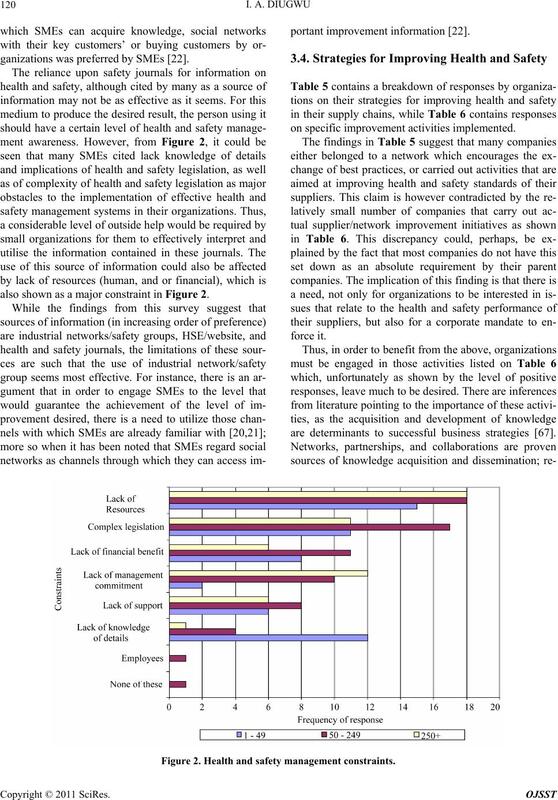 Who enforces Health and Safety in your business sector? If “Yes”, what was the purpose of the visit? B.8. What was the outcome of the visit? B.11. 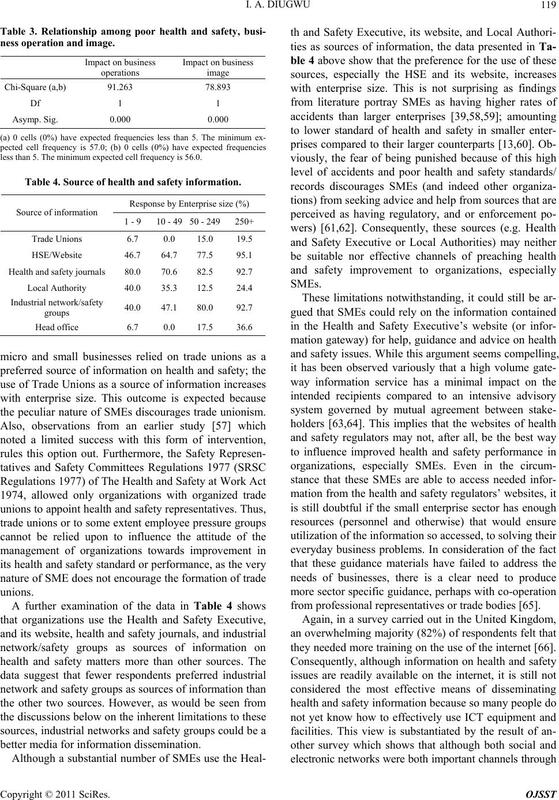 How do you keep informed on Health and Safety issues and regulations? C.1. Do you have a formal health and safety policy that describes roles and responsi bilities? damages, near misses, fires, explosions, etc.)? C.3. Do you conduct accident/incident investigations? C.4. Do you document, invest i gate, and discuss near miss accidents?